This article was first published in the Life supplement of The Spectator on 30 November 2013. In a studio above the Clink prison museum near London Bridge, Richard Hoptroff shows me his latest invention: the world’s first atomic pocket watch. It’s more accurate than any other kind of watch, he explains gleefully, ‘by a factor of thousands’. He is making 12, each costing £50,000, though the atomic component is not of course something he can build in-house: it comes from a company called Symmetricom, which originally miniaturised it for use in drone missiles. Buyers must sign a form promising not to use their watches ‘as a weapon’. Hoptroff, a scruffy-haired physicist who named his project Atom Heart Mother, after a Pink Floyd album, only got into watches in his thirties, when he had to wear one to learn to fly his new plane (previously he had been involved in tech start-ups — hence the plane). His other innovations involve Bluetooth technology and 3D laser printing. ‘We are doing things people haven’t imagined before,’ he says. Hoptroff is one of several hardy entrepreneurs in Britain taking on the Swiss. They are a patriotic bunch, trying to make as much of their watches as possible. 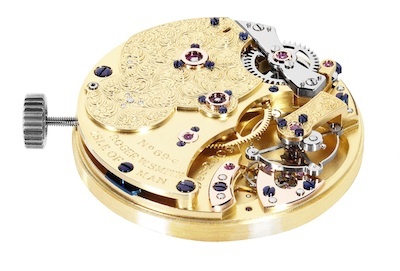 Watchmaking, after all, is a British invention. Most of the early breakthroughs were British. In 1800 half the world’s watches were produced here. But by 1980, our industry had died. Its decline began in the 1890s, when British craftsmen, unlike their counterparts in America and Switzerland, failed to embrace mass production. Cheap electronic watches in the 1970s finished it off. Yet, while the industry collapsed, a passion for watchmaking lingered. The pioneers of the revival are Nick and Giles English, two brothers from Norfolk. They gained a love of watches, planes and other mechanical things from their father, Euan. His death in a plane crash led them to quit their jobs in finance and, in 2002, found their company, Bremont (named after a farmer, Antoine Bremont, whose field they were forced to land in while flying across France). Now, Bremont has a turnover of £11 million, and has just opened a branch in Hong Kong. Fans of its aviation-style watches include Tom Cruise, Orlando Bloom and Ewan McGregor. The company wants to bring manufacturing back to England. At the moment it only assembles the parts here. Crucially, its movements — that is, the cogs, wheels and plates that make the hands tick — are made in Switzerland. For many, that indicates the limits of the English resurgence in watchmaking. Until movements are made in Britain in any quantity, they say, we won’t properly have a watchmaking industry at all. But plans are afoot. Bremont, according to Nick, is working on a movement which will be partly made in England. Another company, Meridian, set up last year, says it will have its own movements ready for next November. English movements are being made — just in very small quantities. In a cottage on the Isle of Man about a dozen entirely English watches are produced each year. They represent the pinnacle of the watchmaking craft. The story of these watches goes back to 1969. As the industry slowly collapsed, a lone genius from north London began making watches by himself — the first person ever to do so, mastering the 30 or so crafts involved. That watchmaker, George Daniels, who died in 2011, had only one apprentice, Roger Smith, who now continues the tradition with a team of six or so. The watches they are producing this year cost £172,000 each. Watch aficionados are in awe of these pieces. But they are not the only English-made watches around. Robert Loomes, an eminent watch and clock restorer in Lincolnshire whose family have been in the business since the 17th century, had his own way round the difficulty with movements. Instead of making them, he found unused ones, produced by Smiths, an English company, in the 1950s, which had been gathering dust in a warehouse. He built the rest of the watches around them. There is limited scope to these — only 100 watches have been made so far. Indeed, out of all the British manufacturers only Bremont is making more than a few hundred. Mike France, co-founder of Christopher Ward, says Britain’s industry is unlikely ever to challenge the Swiss. But he suggests its small scale means it’s more nimble, able to adapt to change. With more investment in training, he says, it can ‘push the art of watchmaking forward’, taking the lead in terms of ideas.